The Kerala Football Association (KFA) distributed the Best Player Awards for the 2015-16 season during the its Annual General Body meeting at the Jawaharlal Nehru International Stadium in Kaloor on June 29, 2016. Kerala’s Santosh Trophy State Team captain V.K. Shibin Lal received the KFA Player of the Year 2015/16 award, while P. Jamsheena (Pathanamthitta) was hounoured with the KFA Women’s Player of the Year 2015/16 award. 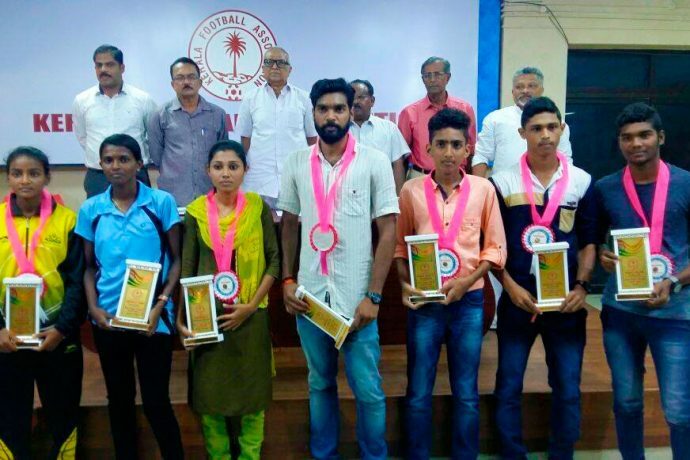 Bijesh Balan (Kottayam; KFA Youth Player of the Year), Mohammed Inayath (Kozhikode; KFA Junior Player of the Year), Salman Fariz (Kozhikode; KFA Sub-Junior Player of the Year), Anjana M. Babu (Kottayam; KFA Women’s Junior Player of the Year) and Manasa K. (Kozhikode; KFA Women’s Sub-Junior Player of the Year) claimed the remaining awards.